I love Christmas and I've tried to hold off doing any Christmassy posts for as long as possible, but I feel like the middle of November is an acceptable time to get going. I'd kind of planned for my first Christmas post to be a baking one (of course), but I was so stupidly excited by this post that I'm writing now that it only deserved to be the first of the season. 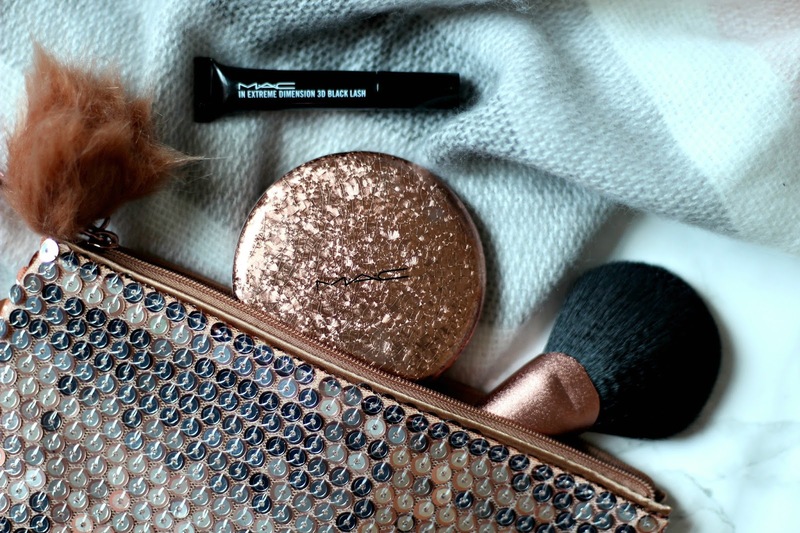 As you've guessed by the title, today, I'm talking about MAC, a brand that I don't think has ever featured on The Northernist before, but more specifically, a little set that they released as part of their Christmas line. I'll be real, I had no idea that they'd brought out their Christmas bits until I saw that Beth and Lucy had bought a few bits from them. I remembered seeing some little previews earlier in the year, but after reading the girls' blogs, I hopped over to the MAC site for a look at the rest of the range. While there was a bunch of gorgeous items, I instantly fell in love with the Snow Ball Face Bag set. 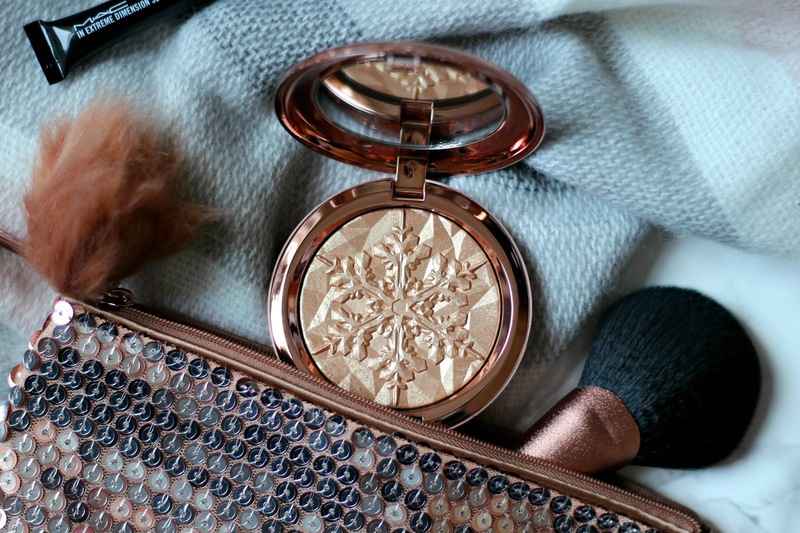 There was something so enticing about it's rose gold-ness and the pompom, let alone that absolutely stunning highlight, which I'll get on to later, so I just knew I had to have it. I was so excited for it to arrive and when it did, I practically tore the packaging off to get a good look at the contents. So, I'm going to start by telling you all about the non-highlight products that came with the kit, the first being the most adorable little makeup bag. As you can see in the photo above, it's a rose gold, sequinned zip-up bag with a little pompom keyring. 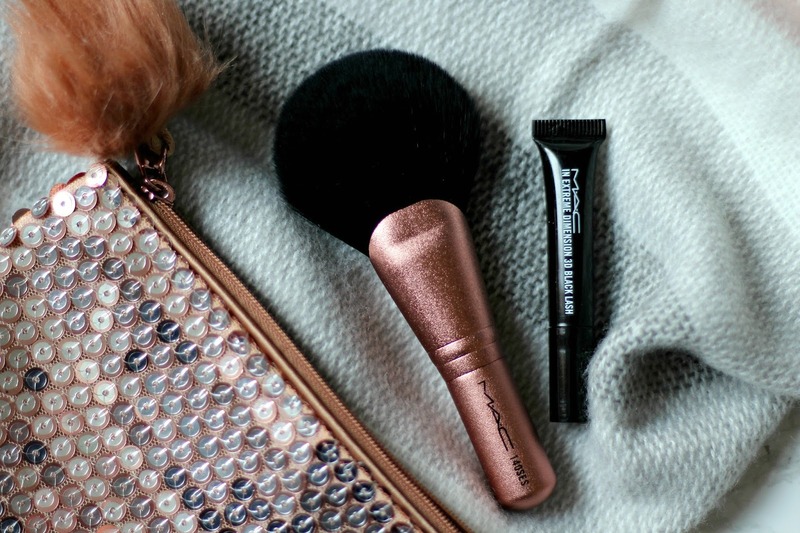 It's a really great size for travelling and while it's glitzy, it's not too crazy. Who could resist a sequin, right? I should've combed the pompom with my fingers before taking these snaps - it looks a little like it's been dragged through a hedge, but trust me when I say that it doesn't always look like that. It complements the bag so perfectly and makes the cutest companion. Next up is the brush and holy moly, this thing is soft. I really didn't need a new makeup brush, however, the brush that I usually use for my highlight isn't really designed for it, whereas as the MAC one totally is. Again, it keeps up with the rose gold theme in the handle, but it also has a bit of a shimmer to it too. The bristles extend out quite long, which I think is a bit unusual for a highlight brush, but they're also rounded at the end, making them the perfect shape for swiping along your cheekbone. It's a gorgeous brush, and like I said, it's super soft, so I can't wait to use it! And the last product that isn't the glorious highlight is the sample of the Extreme Dimension 3D Black Lash mascara. I only received this as I'd spent enough money to receive a freebie of my choice and it was either this or a primer, so I opted for a mascara. I haven't looked at any reviews, so I've got no idea what this product is like, but I'm looking forward to giving it a go. On to the beauty that is the highlight - the reason why I bought this set. I have never been as drawn to a highlight as much as I was drawn to this one, and I just couldn't bring myself to let it go. In fact, I don't think I've ever really been drawn to a highlighting product as I've only just recently started to get into them. But anyway, this is MAC's Whisper Of Gilt highlight (which I've heard is pretty difficult to get hold of) in it's Christmas form. It comes in it's own little rose gold component with a crinkled foil effect and a mirror on the inside, which is handy for getting up close to your cheek. But it's the embossing that steals the show. Have you ever seen anything so wonderful in all your life? 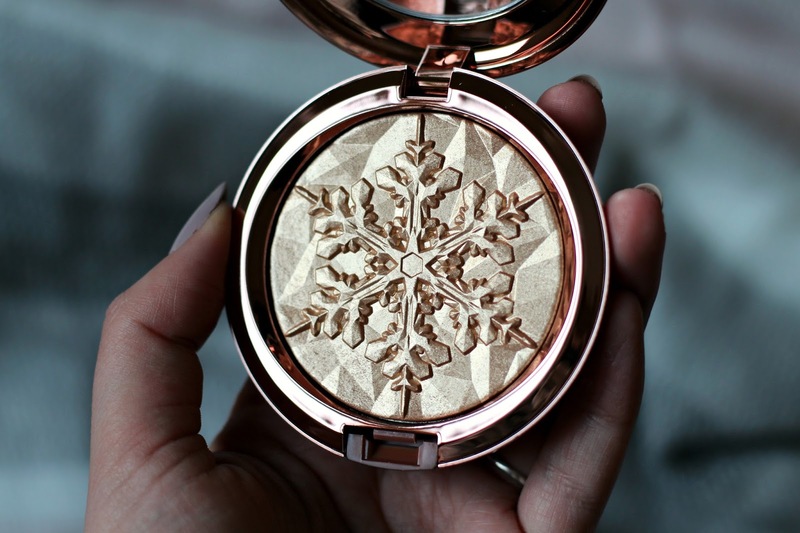 MAC have gone all out and printed a snowflake on top of a geometric pattern and the overall effect is just brilliant. I'll admit, it makes the product almost too pretty to use, but I'm sure that once I'm done cooing over it, I'll happily pop it on my face. Now, I thought I was being very brave by buying this highlight. Like I said, I've only really just got into highlighting products, so the thought of wearing something ridiculously blinding on my cheeks is kind of terrifying to me, so when I saw this baby in the right light, I was a bit like "oh jeez, I'm gonna look like a disco ball." But thankfully, I've found that that wasn't the case! 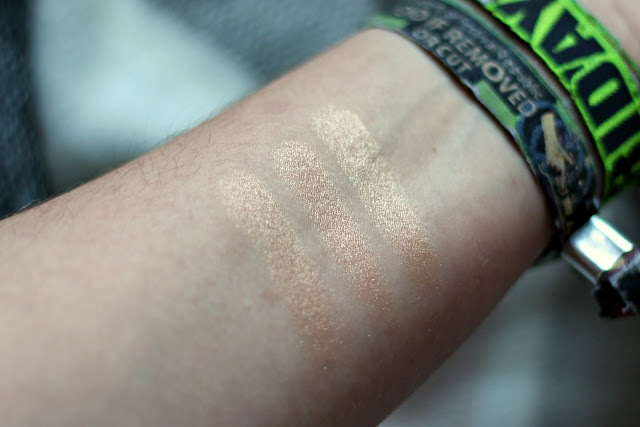 As you can see by these swatches, the shine is pretty intense, but I found that when I was rubbing the product off, it sheered out in the prettiest way, giving the skin a natural looking glow. I also found that it was pretty buildable while swatching, so if I'm feeling daring one day, I could totally layer up and glow to the heavens, but for now, the sheered out option is calling to me the most. As well as the blinding-ness of the highlight, I was also a little worried about the colour. In the pan, it's quite a strong champagne gold shade, but when swatched on to the skin, it was definitely less intense and even less so when sheered out. Again, if you're someone that likes a blinding highlight with vivid colour, this product is totally buildable and could really work for you. Not only does it look amazing, but it was also a joy to swatch. I'm yet to use a brush in it, but it felt so smooth against my fingers and almost buttery. I could tell that it had been finely milled but pressed in such a way that it wasn't crumbly or scratchy. 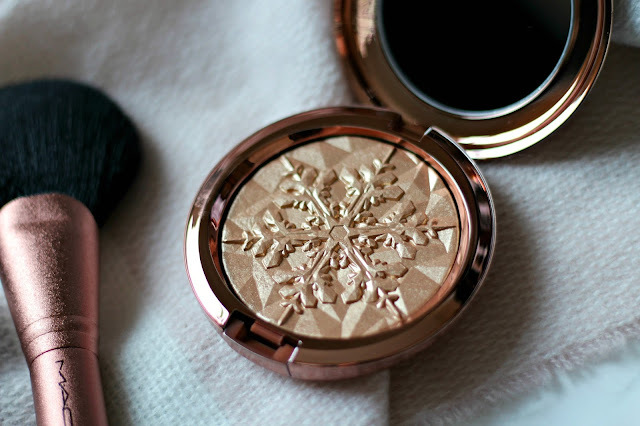 It's just gorgeous - both to look at and use, which is exactly what you want in a highlight! I would love to know what your impressions are of this set. Is it something you'd try or would you give it a miss? Personally, I'm ridiculously excited to use all the bits properly - maybe I'll do a separate post with a full review once I've used them! There are several other things that I've had my eye on from MAC's Christmas collection, like the trio of gold pigments and glitters, so I may have to put another order in soon. If you're interested in purchasing anything, you'll have to get in there quickly, as the Christmas range is famed for selling out pretty fast! Oh my goodness, this is truly stunning! Definitely need this in my life.. ASAP!